If you’re interested in staying current with up to the minute news and information within your community, a digital police scanner is a great device to have on-hand. With a police scanner, you can find out the latest local news, including emergency events, such as burglaries, fires, and traffic accidents. These devices also allow you to get the most current information about the weather forecast, aircraft information, and travel conditions on the roads. In other words, if you want to stay abreast of the latest news that could affect your daily life and the lives of your loved ones, a digital police scanner is an absolute must. Not only are they useful for anyone who provides emergency services, such as dispatch operators and EMS personnel, but they’re also great tools for the average person. To learn more about each digital police scanner, read through the following reviews. Once you’ve decided on an option that will best suit your needs, click on the yellow link to find the best prices currently available on Amazon. 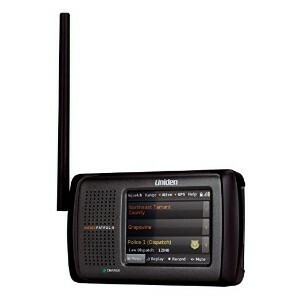 The first option on our list of the best digital police scanners comes from Uniden, a very reputable manufacturer of a variety of communication and other technological devices, including HAM radios, CB radios, two-way radios, and walkie talkies. All of the devices they offer are outfitted with the latest technology and are durably constructed, including their HomePatrol 2 Color Touchscreen Simple Program Digital Scanner. This digital police scanner was designed with ease of use in mind. Unlike a lot of other police scanners that are on the market, this device is incredibly easy to operate; all you have to do is input the name of your city or your zip code and the unit will automatically load all of the frequencies, trunking systems, alpha tags, and sub-audible tones for your area. You can also use it to stay current with the latest information anywhere you may be traveling to; by adding a GPS receiver, the scanner will automatically tune itself to the location. The fact that it’s outfitted with a color touch screen makes it even easier to use! There aren’t any awkward or confusing dials to figure out; all of the information you need is clearly visible on the screen, and you simply have to touch it to change the settings. Other notable features include weather alerts, quick record and playback, and instant replay. You can use this scanner in your home, or you can connect set it up in your vehicle and connect it to your speakers to receive the most up to the minute information when you’re traveling. Powered by rechargeable batteries, which are included, this device is durable, easy to use, feature rich, and can be used virtually anywhere. Final Verdict: If you’re looking for an easy to use police scanner that you can use at home or in your vehicle, the Uniden HomePatrol 2 Color Touchscreen Simple Program Digital Scanner is a great option to consider. It offers an easy to operate touch screen, it’s loaded with features, and it offers a very user-friendly interface and experience. If you’re looking for a desktop digital scanner, the Whistler TRX-2 Desktop Digital Scanner is a great option to consider. Whistler is another highly reputable name in the communication technology industry. The manufacturer offers a wide range of products, including long-range two-way radios, business two-way radios, radar detectors, long-range walkie talkies, and various other devices. Like all of the products that they manufacture, their TRX-2 Desktop Digital Scanner is durable, easy to use, and very reliable. This device is a multi-system adaptive trunking scanner. 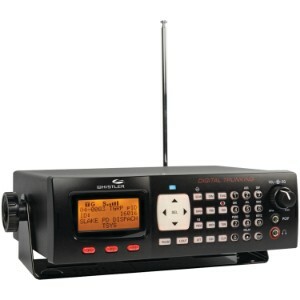 It’s outfitted with Motorola P25 Phase I, X2-TDMA, Phase II, and DMR, so it’s able to monitor various encrypted channels. Thanks to zip code programming, this device is incredibly easy to set up; just input your zip code and it will automatically load the information for the area that you selected. It’s preloaded with both American and Canadian databases and comes complete with a MicroSD card. You can store up to 200 scanlists, as well as a Skywarn scanlist, and it can map as many scanlists as you’d like, so you’ll have total flexibility. You can update the database and the firmware on this scanner using the Internet. A dedicated Skywarn weather button makes it easy to keep tabs of the latest forecast. It has a compact design, so it won’t take up tons of space on your desktop; or you can mount it in your vehicle, if you choose. Plus, it’s quite durable, so whether you use it in your home or office or in your vehicle, it will last a long time. Final Verdict: The Whistler TRX-2 Desktop Digital Scanner can be used on a desktop or in your vehicle. It’s compact, durable, and offers incredible connectivity and easy programming so you can stay current with all of the latest news and information in your local area. If you’re interested in a handheld digital police scanner, the Uniden BCD436HP HomePatrol Series Digital Handheld Scanner is a great option to consider. 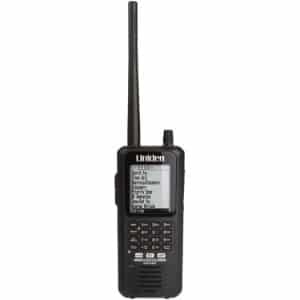 As mentioned, Uniden is a well-known manufacturer of a variety of communication and tracking devices, including car GPS, marine GPS, and motorcycle GPS devices; among other high quality products, so you know you can be sure that the BCD436HP handheld digital police scanner is durable and reliable. This digital police scanner features both USA-based and Canadian-based radio databases, so you can use it in either country to receive up to the minute news and information. Outfitted with an enhanced dynamic memory, you can control the size of your banks so that you can save as much space as possible. It also offers both narrowband reception and location-based scanning, so you’ll always get the latest breaking news. With SAME weather alerts, you can stay current with the latest news and weather information in your area and make plans as necessary when a storm is in the forecast. This device features TrunkTracker V, which allows you to tune in to a range of trunked systems. With Close Call RF Capture Technology, you’ll be able to detect and tune into any transmissions that are in your area, no matter if they’re programmed into your device or not. You can also connect this digital police scanner to a GPS system so you can get updated information when automatically when you’re traveling. Since it’s handheld and offers 8 hours of battery life, it’s totally portable; plus, it comes with all of the necessary accessories. Final Verdict: The Uniden BCD436HP HomePatrol Series Digital Handheld Scanner is durable, portable, easy to use, and provides up to the minute information in your area with ease. Plus, it offers a range of features that allow for the most convenience possible. Next up on our list of the best digital police scanners is another option from Whistler, one of the best names in the digital technology industry. Their WS1065 Desktop Digital Scanner offers a range of features that will allow you to stay abreast of the most current news and information in your area; plus, it’s incredible easy to use and offers a robust design. Featuring Menu Driven Programming, complete with Context Sensitive Healp, every menu offers assistive text that makes it easier to program and utilize the device. A scan-list function lets you set up, group, and scan objects based on your individual preferences. With Memory Backup, your frequencies will always stay in the memory of the device, so you’ll be able to take advantage of extended power. Skywarn Storm Spotter technology provides instant access to weather updates and alerts. Plus, there’s a Free-Form Memory Organization, which lets you dynamically allocate the memory as efficiently as possible. And, with Digital AGC, the scanner automatically adjusts for low audio levels so you can hear clearer transmissions. Final Verdict: For a sturdy digital police scanner that can be used in the home or office or in a vehicle, the Whistler WS1065 Desktop Digital Scanner is a good option to consider. It offers all of the basic features, as well as some additional functions so that you can stay connected with the latest information in your area. 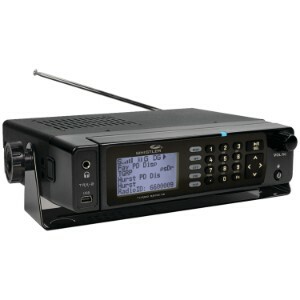 The last option on our list of the best CB radios is the Whistler WS1040 Handheld Digital Scanner Radio. This option is a bit pricey, but being that it offers so many robust features and that it’s made by Whistler, we think that it’s a worthwhile investment. 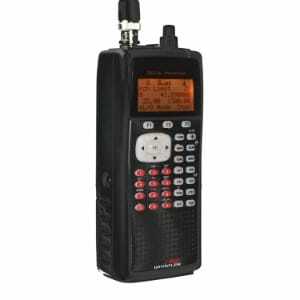 If you’re looking for a handheld digital police scanner, this is a good option to consider. Featuring menu driven programming with context sensitive help, every item on the menu gives you help details to make programming and using the scanner as easy as possible. A Scan List function lets you arrange, group, and scan all of your items based on your individual preferences. With Free-Form Memory Organization, this device dynamically organizes your memory so that it’s as efficient as possible. You can stay current with the latest weather forecast, too, thanks to the Skywarn Storm Spotter feature, which offers instant access to the frequencies that are used by storm spotter networks. A digital AGC automatically adjusts low audio levels to provide the clearest reception. It also offers data cloning, so you can transfer the data you’ve programmed to a different WS1010 scanner. Final Verdict: The Whistler WS1040 Handheld Digital Scanner Radio is a portable, lightweight digital police scanner that will give you instant access to local news and information wherever you are. It offers all of the features that you could need for on-the-go updated information. With a digital police scanner, you can listen to the conversations between police, fire and rescue workers, and all other types of emergency responders and weather groups in your area. These devices are a great way to stay current with the latest news and information. Handheld or fixed. There are two types of scanners: handheld and fixed. Handhelds resemble a walkie talkie and are portable, while fixed units are mounted to a specific location. The amount of channels the scanner offers is important because the more channels it features, the more agencies you’ll be able to access. Lists and banks. These features allow you to classify your channels into categories for easier use; police, fire, and EMS, for example. GPS compatibility. With GPS compatibility, the scanner will be able to tell if you’re in a different area and will automatically update your information for that area. A digital police scanner allows you to listen to conversations between emergency service personnel, such as police, fire officials, and EMTs. All of the devices featured in our review are exceptionally high quality, durable, and easy to use, allow you to gain up to the minute information for your area.